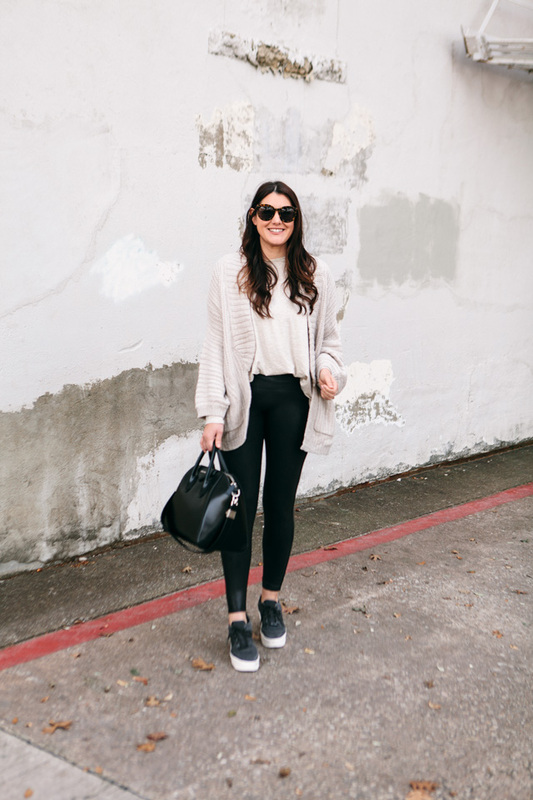 In my efforts to show more of my ‘everyday’ style, I thought you’d want to see one of my go-to’s for a day that involves either errands or just working at the warehouse. Gemma is with my mom for about half of the day, the other half we are usually running errands or playing at the house while I cook dinner or pick up. So I usually go with some sort of outfit that meets my day halfway; stylish but easy to pick up and chase after a toddler, if and when she runs because she’s got two speeds: asleep and full sprint. Side note: I like to call my ‘mom outfits’ my mother effort. Pun or innuendo is 100% intended. I love a neutral on a neutral look. This slouchy cardigan (on sale! use code SAVE25 for an extra 25% off!) is a really nice neutral to take into spring. It’s very generous in the size, but I am in the M/L. This tunic is so freaking soft, I want it in every color. I initially picked up the oatmeal color, but you can’t go wrong with any of them. All are leggings friendly 😉 You can find this $25 tunic here in 4 different colors. Have you taken the plunge into the dark world of obsession that is the Spanx leggings? I forget about them for a week then I put them back on and never want them to leave my body. Like a fancy yoga pant that goes with almost anything. You can find them here! The top is a generous fit, size down for a closer fit but expect it to be loose! I am in the medium, my normal size but I love loose clothes 😉 The cardigan is loose as well, size down or expect a super slouchy fit! The leggings I sized up to a large and I’m happy with it! Shoes fit a half size smaller. I love this outfit and I’m glad to hear that those sneakers are easy to style because they are too cute. Also, you’ve totally sold me on those leggings! I love this! Please keep sharing more of your everyday, mother effort looks. 😎 They fit the stage of life I’m also in right now, and it’s good inspiration for me. Have a great day, Kendi! I’m all for the Spanx leggings! Seriously why are they so amazing! And this outfit is something I’d love to wear all the time!